Special Cell of the Delhi Police claimed to have arrested a member of the terror outfit Harkat-ul-Mujahiddin, Asad Hilal, who had been absconding since 2001. Asad was accused of harbouring two alleged Pakistani terrorists six years back. UP Director General of Police Vikram Singh stated that a secret agency has now been alerted to round up and deport illegal immigrants hiding in Ghaziabad and Noida. Speaking at a function of 41st Battalion of PAC in Vaishali here yesterday, he said that the agency will also probe the presence of as many as 10 Pakistan nationals suspected to be hiding in these two districts of the state post-1971. Indian IT companies are relocating to smaller cities, as the unabated rise of the rupee against the US dollar continues to eat away at their profits, said an Assocham report. With the Indian economy booming, smaller cities are going to drive realty growth, says a FICCI-Ernst & Young report. Farmers from over a dozen villages in Greater Noida have decided neither to hand over their land to Greater Noida Authority nor accept compensation at a panchayat held at Inter College, Roza Yakubpur yesterday under the banner of Kisan Sangarsh Samiti here. The villagers were from over a dozen villages, including Etoda, Sadopur, Roja Jalalpur. Many other villages have taken up cudgels against the section four under which land acquisition is being undertaken. The Delhi government will either bring a legislation on labelling products as "Ozone Friendly " or adopt a Central legislation to this effect which would ensure protection of ozone layer. The Central Information Commission (CIC) has warned the government against victimising or penalising anyone seeking information under the Right to Information Act. Close on the heels of an expose showing high levels of heavy metals in plastic and PVC toys, an environmental group today, revealed a study that uncovered dangerously high amounts of lead in household paint samples from Mumbai and Delhi. Indira Gandhi National Open University (IGNOU) and American Hotel and Lodging Association Education Institute (AH-LEI) signed an MoU on Monday for launching a BA degree in international hospitality administration. The finance ministry on Monday came out with a relief measure of refunding the service tax that exporters pay for port, road transport and rail services, but exporters termed it as a "half-hearted measure". Delhi assembly in its ongoing monsoon session today passed two bills--Delhi Fire Service Bill 2007 and Bread and Breakfast Bill. It also tabled India Stamp Delhi Amendment Bill 2007 and National Law School of Delhi University Bill. Prime Minister Manmohan Singh has approved the appointment of a high-level committee to coordinate the development of new road links between Delhi and Gurgaon. The committee would be chaired by the Member Secretary, Planning Commission, with four other members. BJP Delhi Pradesh president Harsh Vardhan has demanded that the Delhi government should enquire into the cases of kidnapping of girls from Delhi.As many as 700 girls are reportedly kidnapped from Delhi every year. Presently the CBI is investigating these cases. A 28-year-old woman died while her husband's condition was stated to be critical after they allegedly consumed poison in their west Delhi home on Monday, police said. Wife of a software engineer committed suicide in Sector 22 here on Thursday following her husband's insistence that she should not abort their first child. With the arrest of Javed, Mohd. Arif, Asif and Rashid, north-east district police claimed to have busted a gang of dacoits, who were allegedly planing to commit a robbery in the Brij Puri area. Vijender Gupta, Chairman, standing committee, today said that the strength of ward vending committees under the national policy on street vendors had been increased from 134 to 272 members, keeping in view the increased number of wards in the corporation. All the zonal deputy commissioners have been asked to reconstitute ward vending and zonal vending committees. K.Vijayaraghavan, general secretary, RWA, Mehrauli , applied for a name change, meter change and removal of poles from his land .He paid an amount of Rs 17,600 vide receipt number 89746. 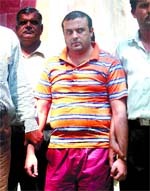 The police learnt that Asad would come to the Anand Vihar bus stand to catch a bus to Uttar Pradesh. and he was arrested. Asad had been wanted since 2001 when the police in New Friends Colony arrested his two accomplices. A hand grenade and two detonators were recovered from them and during interrogation, it was revealed that Asad had arranged for the stay of the terrorists in Delhi. According to the police sources, Asad met the two accused in Jamia Millia Islamia University through one Habib, who is still absconding. UP Director General of Police Vikram Singh stated that a secret agency has now been alerted to round up and deport illegal immigrants hiding in Ghaziabad and Noida. Speaking at a function of 41st Battalion of PAC in Vaishali here yesterday, he said that the agency will also probe the presence of as many as 10 Pakistan nationals suspected to be hiding in these two districts of the state post-1971. There is no police laxity in providing security to the women in UP state, Vikram Singh asserted. "We shall do all that is possible to improve policing and traffic scenario in the state". He also assured of effective steps against criminals and there is a definite decline in incidents of chain snatching and harassing women in Uttar Pradesh, said the DG police. These incidents are being viewed very seriously. Auto thefts have made a dent of about Rs 22,000 crore, he says. This is a national loss and soon carjackers will be put in a tight spot. "From almost all cities of the state, incidents of chain snatching, thefts, loots in houses and shops, dacoity and car thefts are being reported. Loss from car thefts alone is estimated to have crossed Rs 22,000 crore, the DGP said. Orders have been given to the police force to teach the thieves and bandits a lesson. A new police control room equipped with the latest equipment is being readied at a cost of Rs 1.8 crore, the DG said. He claimed that the land mafia in the state has been cornered now and land worth Rs 80 crore unearthed from the mafia. Strict orders have also been issued for nabbing the wanted criminals and for keeping an eye on the activities of the criminals lodged in jails, DG police Vikram asserted. Additionally, the Software Technology Park of India (STPI) scheme, which provides various tax concessions for the IT and ITeS companies, is expiring in March 2009. This is also serving as a reason for IT and ITes firms to shift base, according to the "Outsourcing Industry Strategies to Counter Appreciation of Rupee" report by the Associated Chambers of Commerce and Industry of India (Assocham). More and more IT companies are relocating to tier-II and tier-III cities such as Lucknow, Kochi, Varanasi, Mohali, Jamshedpur, Allahabad, Chandigarh, Dehradun and Mysore to lower operational costs by about 15 per cent. The trend is particularly noticeable among BPO units based in Gurgaon, Bangalore, Hyderabad, Delhi, Noida, Chennai and Kolkata, the report said. It urged extension of the STPI scheme benefits for another 10 years so that technology exporters can avail of tax incentives, which would enable them to meet their export targets and sustain the growth momentum. Citing examples of other countries such as China and the Philippines, which are offering significant tax concessions to attract global companies, Assocham said India should not be lagging behind, as it is regarded as one of the most preferred outsourcing destinations in the world due to low labour costs and large talent pool. Without the extension of tax benefits, the Indian IT-ITeS industry, which is expected to provide employment to 10 million people by 2010, would be adversely affected, the report pointed out. Shifting of IT firms to smaller cities, the Assocham said, however augurs well for development of these places and is expected to create 200,000 jobs in the next two years—IANS. Improving infrastructure, urban governance, rapid influx of knowledge industry professionals, improving quality of life and rising prosperity would lead to the development of smaller cities such as Surat, Chandigarh and Nagpur, according to the report brought out jointly by the Federation of Indian Chambers of Commerce and Industry (FICCI) and Ernst & Young. According to the report, cities that have tremendous growth potential are Vadodara, Visakhapatnam, Jaipur, Thiruvananthapuram, Kochi, Nashik, Indore and Ludhiana. "The real estate sector is witnessing exponential growth and attracting immense interest from developers, consumers and investors in India and abroad," said Ganesh Raj, partner and national leader (real estate practice), Ernst & Young. Demand for commercial office space, unexplored resources and low labour cost is driving investors towards smaller cities and towns, the report noted. It is estimated that Indian developers have been able to raise upwards of $4 billion via the capital market in the past two years. "Institutionalisation and evolution of Indian real estate will get a fillip from large-scale investment in infrastructure planned by the government over the next 4-5 years," said Amit Mitra, secretary general, FICCI. "India's Planning Commission has estimated that investment in infrastructure - defined broadly to include road, rail, air and water transport, electricity, telecommunications, water supply and irrigation - would need to increase from 4.6 percent of GDP to between 7-8 percent during the Eleventh Plan period (2007-2012), which would entail an outlay of almost $320 billion over the plan period," Mitra added. In another panchayat convened at Roja Jalalpur, farmers have decided to hold a demonstration at GNIDA office on 20 September. The farmers from Etoda, Sadopur, Roja Jalalpur and four other villages have joined the Kisan Sangarsh Samiti post Greater Noida Authority's acquisition of farmlands. Farmers from many villages including Paliwadi, Emnabad, Bisarakh, Sabri, Chhoti Milk, Milk Lachhi, Rettori, Hebatpur, etc had attended the panchayat. Addressing the gathering, Kisan leader, Bihari Singh called upon the farmers to stand united in the struggle against the GNIDA if they wanted to save their lands from being forcibly acquired by the government. Raj Kumar Bhatti of Jan Morcha said that a farmer should have the final word in selling off his land without any coercion. District Congress Chief Mahender Singh was of the opinion that government should acquire only thirty percent of land for industries, while industrialists should directly purchase the rest of the 70 per cent land from farmers. 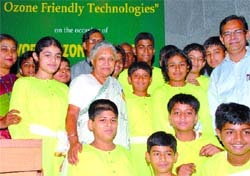 Chief Minister Sheila Dikshit said this at a seminar "Ozone Depleting Substances Phase Out". Students of Ahlcon Public School presented a skit underlining the importance of protection of ozone layer. Among others who attended the seminar were secretary environment J.K. Dadoo, Jt. secretary, union ministers of environment Dr. B.P. Nilaratana, consultant ozone cell, Government of India ,Prof. S.K. Mukharjee, dean, School of Environmental Science ,JNU ,Prof. V.K. Jain and others. Chief Minister expressed her pleasure that India was receiving the Montreal Protocol Implementers Award today at Montreal in Canada on the occasion of 20 th anniversary of the protocol, which was signed on September 16,1987, and 191 countries had signed this so far. "It is our endeavour to take number of policy measures including regulatory measures to encourage adoption of new technology by existing and new enterprises. The 13 th World Ozone Day is being celebrated to commemorate the date of Montreal protocol on substances that depletes the ozone layer". A depleted ozone layer allows ultra - violet rays of the sun to reach earth exposing mankind, flora and fauna to its harmful effect. Every year two to three million people get affected by skin cancer due to this harmful effect. The ozone layer is being depleted by use of chloro-fluro-carbons (CFCs) which are gases used in refrigerators, air- conditioning, aerosols, foam products etc. Hence it is essential to label stickers stating that such goods are ozone friendly products. She expressed confidence that schoolchildren and teachers would be able to bring awareness about protection of ozone layer. This would also help in curbing effects of climate change. "The commission makes a strong recommendation to the concerned authorities to ensure that people seeking information are not victimised or penalised for utilising or taking recourse to a piece of legislation which has the sanctity of parliament," said a CIC bench, headed by Information Commissioner O.P. Kejriwal. The bench issued the directive on September 11 to the union ministry of urban development, while hearing a complaint filed by a Delhi resident. Harish Tripathi, a Delhi's Gymkhana Club member for over 40 years, had sought information on the rampant misuse of facilities and financial liabilities of the club in November 2006. Tripathi told the CIC bench that instead of getting the requisite information from the ministry, his club membership was temporarily revoked. Kejriwal observed, "By doing so, they (Delhi Gymkhana Club) would only be bringing a bad name to an organisation which otherwise enjoys a good reputation." "The idea behind this research was to determine the total concentration of lead in decorative paints of all types- plastic, enamel and exterior, intended for residential use. Although lead as a source of health hazard has been studied in soil and toys, very few studies have been conducted on paints in India," said Ravi Agarwal, director of Toxics Link. The tests on the samples showed alarming levels of lead in enamel paints (with a gloss finish) and this held true for most paints available in the market. "Of the 31 enamel paint samples analysed for lead concentration, 83.87 per cent had more than 600 parts per million (ppm) of lead, 19.1 per cent had less than 600 ppm," said Dr Abhay Kumar of Toxics Link and author of the study. Last week, Toxics Link in collaboration with a television channel found that branded toys from toy stores in Delhi, many claiming to be non-toxic, contained dangerous amount of lead. The samples, when scientifically tested, showed that a staggering 65 per cent of the toys were contaminated with lead, and 14 per cent of the samples were heavily contaminated with other elements. The internationally accepted danger mark for lead in toys is 90 ppm. But, the lab tests conducted on the toys reveal lead content from 190 ppm to 600 ppm. These contaminated toys were not only Chinese, but branded Indian toys available at leading stores across the country. "High concentration of lead in enamel paints is the most worrying part of the whole issue. Except for one brand, others had multiple samples that contained high concentration of lead, exceeding the voluntary Indian standard of 1,000 ppm and the US standard of 600 ppm," said Kumar. The study is believed to be the most comprehensive research on the issue both in terms of the sample size and the range of paints. All samples were tested at Galson Laboratories in New York. The Bureau of Indian Standards has slated 1,000 ppm as the benchmark for acceptable level of lead in paints, which is not only voluntary, but also optional as part of the Ecomark labelling. "Therefore, a manufacture is not bound by law to provide safe household paints, even if they pose serious health hazards," said Agarwal. Prolonged exposure to lead causes high blood pressure, particularly in middle-aged and older people and could also result in anaemia. The worst scenario envisaged by doctors says that lead can severely damage the brain and kidneys in adults or children and ultimately cause death. High-level contact in men can damage the organs responsible for sperm production, says Toxic Link. IGNOU has initiated this move after seeing the high level of growth that has occurred in the hospitality, tourism and allied service sector over the past year. Professionalism is of immense importance in this sphere and to achieve this, quality education and training are the key. "This is a forward step in the right direction," says Prof V.N. Rajasekharan Pillai, VC of IGNOU. "This is truly a global alliance in hospitality education with an institution belonging to the world's largest hotel industry association." The program will be available at IGNOU-AH-LEI approved centres after the next batch of IGNOU admissions. "The American Hotel and Lodging Educational Institute is proud to be associated with India, and IGNOU in particular," stated Roy Kennington, CHA president and the CEO of AH-LEI. "The whole world counts on India to be a power house of human capital and talent. With fast paced development in every sphere of activity, the travel and tourism sector has been making quantum leaps. Indian hospitality professionals who have been certified and bench-marked with global competency have a great opportunity to be world-class hospitality leaders and are sought after universally." "While exports are subject to various kinds of service tax, the present notification only provides for refund of service tax on port services, services of transport of goods by road or rail from inland container depot to the ports of exports," Ganesh K. Gupta, president, Federation of Indian Export Organisations (FIEO) said in a statement. MLAs across the party line accepted the recommendations of the Bills in the House. Delhi Fire Service (DFS) was in dire need of power to remove encroachments in congested areas. 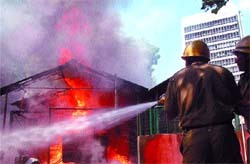 In many cases, huge loss of life and property was reported as firefighters were unable to reach the spot during emergency. Roads are encroached upon from both the sides. Now the DFS has been given power to remove encroachments with the help of police wherever it needs. The Bread and Breakfast Bill is aimed at providing hospitality to visitors for Commonwealth Games in 2010. There are not enough hotels and restaurants in the national Capital to give space to the visitors. Now residents would be allowed to have paying guests. They include the Secretary, Department of Road Transport and Highways, the Secretary, Ministry of Finance, the Chief Secretary, Delhi Government and the Chief Secretary, Haryana. The committee will facilitate development and establishment of new road links between Delhi and Gurgaon. It will be free to co-opt other secretaries whenever necessary. He has demanded from the Delhi Police Commissioner that the SHOs should register cases of missing girls in their areas and also inform the DCP. The issue got media attention when Thakur Das, a resident of Mangolpuri tried to immolate himself outside the local police station because the police did not enquire into the kidnap case of his 17-year- old daughter. Thakur Dass had stated that his daughter was kidnapped on the September 5. When he went to the police station, he was driven out and the report was not lodged. He continued to visit the police station for three consecutive days but with no avail. After being disappointed he tried to kill himself. Harsh Vardhan also alleged that the gangs of kidnappers abduct girls from the weaker sections. They are forced into flesh trade. The data of the National Crime Record Bureau tell that more than 700 girls are kidnapped from the national capital. Rajni and her husband Raju, 30, were admitted to the Deen Dayal Upadhyay (DDU) Hospital after their neighbours broke open the room of their Baljeet Nagar home in Anand Parbat area and found them unconscious. Police said Rajni was declared brought dead, while the condition of Raju, a cancer patient, was stated to be critical. No suicide note was recovered, police said. The couple had married eight years ago and has two children. According to police, they used to fight frequently over Raju's unemployment. Sonali, wife of Somalya Ghosh, a software engineer in HCL was pregnant and wanted an abortion. But her husband was adamant that she should bear the first child. Sonali's father has lodged a case in Sector-24 police station, accusing his son-in-law to have abetted Sonali to suicide. Somalya has been arrested. Police has found a suicide note from Sonali's room. She has not held anybody responsible for her desperate act. Her father and other family members reached Noida from Bengal on getting the news of Sonali's death. According to the report, Sonali wanted to study further and pursue an independent career. For that she wanted to terminate the pregnancy. There where frequent clashes between them over this issue. Information was received by a team patrolling near Brij Puri that some suspicious people were sitting near the Ganda Nala. A trap was laid near the given point and it was established that the accused were plotting to commit a robbery in the residential area. On personal search, one countrymade pistol with two live cartridges, one rod and one torch were recovered from them. In another incident, the crime branch of Delhi police has arrested one Phool Singh near Rajouri Garden bus stand. The alleged accused was involved in several cases of robbery and auto thefts. He was also involved in a case of firing on the police team. He was the only accused absconding in the case. One countrymade pistol and one live cartridge have been recovered from him. Gupta has invited all interested stakeholders like NGOs, RWAs, representatives of hawkers unions, traders association and commercial banks to be members of the zonal vending committees and ward vending committees. The meter was replaced twice,but neither name was changed nor the poles were removed. He has appealed to senior officers of the BSES but nothing has been done.